Opening Times. JSL Bathroom Suites. Yorkshire. Is JSL Bathrooms Open Now. JSL Bathroom Suites Opening Times. Bradford Warehouse. OPENING TIMES ARE APPROXIMATE AND SUBJECT TO CHANGE WITHOUT PRIOR NOTICE. WE ARE CLOSED ON ALL PUBLIC AND BANK HOLIDAYS. These Are Our Regular Opening Times For The Bradford Warehouse Yorkshire. 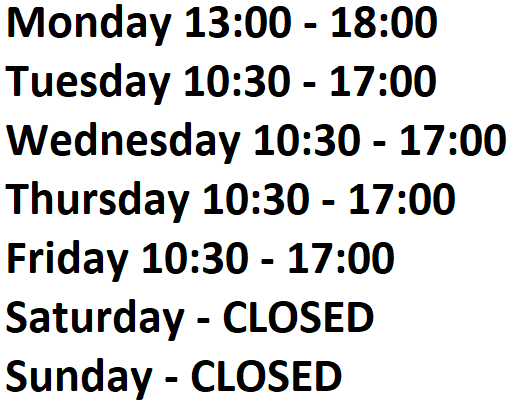 Regular Opening Times JSL BATHROOMS Bradford YORKSHIRE Times Subject To Change Depending On Holidays and the Weather. Opening times are approximate and subject to change. Updates will appear on this page as and when they become necessary. We are now closed until tuesday 30th april 2019 at 10:30am due to essential works. MONDAY 13:00-18:00. TUESDAY 10:30-17:00. WEDNESDAY 10:30-17:00. THURSDAY 10:30-17:00. FRIDAY 10:30-17:00. Specialists in Obsolete And Discontinued Old Bathroom Colours. Replacements And Spare Parts. Brand New Complete White Bathroom Suites At Trade Prices. Whirlpools And 8mm Thick Acrylic Baths In Stock. Many Styles And Sizes Available. Opening Times For JSL Bathrooms Bradford Yorkshire Obsolete And Discontinued Colours. Champagne Indian Ivory Whisper Grey Pink Peach Blue Green Avocado Wild Sage Kashmir Beige Burgundy Sorbet Pampas Sorrento Alpine Bermuda Cameo Melba Coral Ideal Standard Qualcast Spring Shires. JSL Bathroom Suites 17 To 19 Carter Street Bradford Yorkshire.